WAVES worked in a wide variety of jobs, but many of the women with teaching experience like Jean Clark ended up in instructional positions. 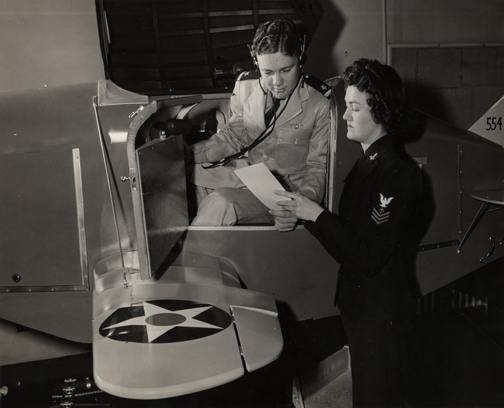 Jean wanted to become a Link Trainer, which used an early form of flight simulation to train men in piloting skills. We had to take aptitude tests. Now, I’m going to brag a little bit. Partly, I think, because I’d been a teacher. All of the girls who were chosen to go to Link School had been in education. I think they felt, “They’ve already learned how to teach. After that, we can teach them the subject matter and they can teach it.” That was their theory I’m sure. They said it was the top thing and if it was the top thing, that’s what I want (laughs). So, everybody was envious if we got it. There were only 50 of us I think that got it. So not too many. This is a photo of Jean training a man in the Link flight simulator. It comes from the collection of Jean Clark.